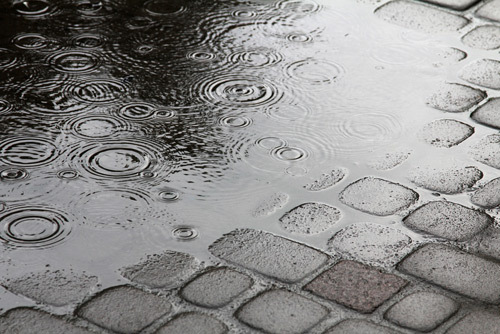 During bad weather, avoid boots or shoes with smooth soles and heels, such as plastic and leather soles. Instead, wear shoes or boots that provide traction; boots made of non-slip rubber or neoprene with grooved soles are best. Keep warm, but make sure you can hear what’s going on around you. If working outdoors during the day, wear sunglasses to help you see better and avoid hazards. Finally, those driving in the rain should also be aware of the increased dangers posed by poor conditions. 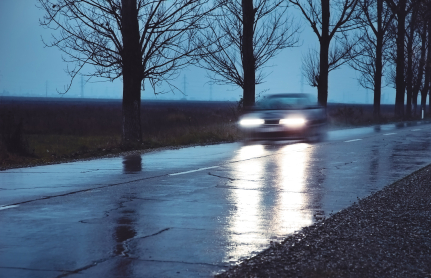 Stopping distances can double in the wet as the friction in between the car’s tyres and the road surface is reduced. In extreme conditions this can result in aquaplaning where the steering becomes unresponsive. If this happens ease off the accelerator and slow down gradually. Stopping distances can increase dramatically when a vehicle’s tyres have a shallow tread depth. If your car has the legal minimum tread depth of 1.6mm it will take you an extra 8 metres to stop at 50mph in the wet compared to a car with 3mm. It’s therefore vital that you factor in the road conditions when calculating stopping distances, as well as checking your tyres regularly and keeping your vehicle correctly maintained. Although you will most likely want to wrap up warm, make sure your clothing doesn’t block your vision or make it hard for you to hear traffic. Don’t wear rain gear or vests that have become dull or are no longer reflective. If driving, ensure you are familiar with vehicle controls. Remember, it is illegal to drive at night without fully functioning front and rear lights. You should also check that all lights on the car are in full working order and kept clean before you start a journey. In darkness it is harder to judge speed and distance, objects can be closer than they appear or travelling faster than first expected. To prepare yourself for any eventuality you should drive at a speed that allows you to spot hazards and react accordingly. For more information on driving see our winter driving tips. Also, don’t forget to sign up to SafetyMatters, RoSPA’s free newsletter, and receive our collection of free original e-books! Handy Tips – Slips, Trips and Falls!